Once again Dorset & Wilts County Archery fielded 6 teams for the Inter-counties competition held at Lilleshall. Mens recurve finished 12th overall. Mens longbow finished 2nd overall. Ladies longbow finished 4th overall. Mens longbow team put on a stella performance finishing second overall for a podium finish. 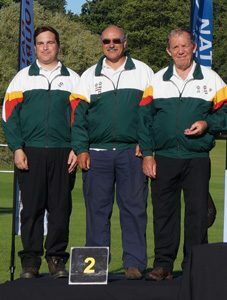 Chris Groom shot his way to 26th overall in the individual ranking in the mens compound WA1440. Terry Ives finished 3rd overall in the mens longbow along with Jayne Cottee who also finshed 3rd overall in the ladies longbow. The county finished 11 overall which is a good result considering we were up against the best in the country.